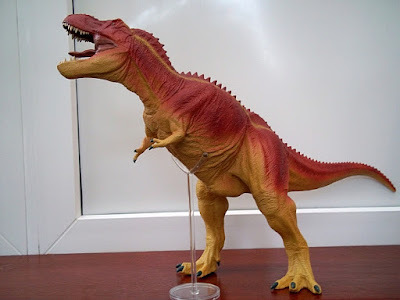 Hello - I noticed your article about small dinosaurs in Hebbronville, Texas. This witness was not exaggerating because I have seen an unknown animal in a field here in Hebbronville. It was April 2011 and I was walking along W. David St. to my friend's house on Randada Rd. at about 5:45 PM. I had just gotten off work. On the side of the road where I was walking, I saw dust being kicked up into the air and moving along the field. Then the trail of dust was heading toward the road in front of me. I stopped walking not knowing what may be exiting at the road. About 40 ft. in front of me was what I can only describe as a little T-Rex dinosaur, about 2-2 1/2 ft in height. It didn't stop running as it dashed across the road into a smaller field. It was light reddish brown, stood on two legs and had a long tail that was straight out as it ran. There is no way that this was a lizard known to live here. It looked very much like the photo of the toy I found online. No one wanted to believe me. My friends and family think I mistook it for another lizard, but I know what I saw. Until I read your article, I thought I may be going crazy. I do believe there are very strange creatures around here. My ex-husband used to talk about huge birds and walking shadows that he and others would see on a ranch south of Hebbronville. At one point several cattle would go missing without a trace. He would never stay there at night. 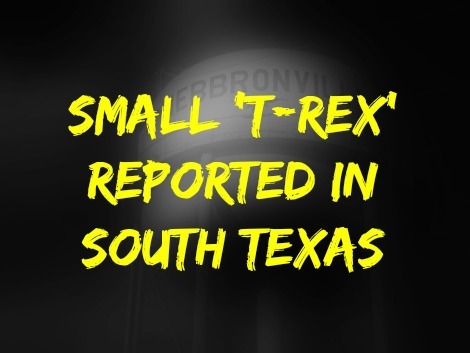 Dinosaurs Run Amuck In South Texas Town? Hello Lon - A couple of months ago in summer, my friend actually saw a small dinosaur here in town, on a main street! It was evening when she saw it, probably around 8:45 pm. She was driving and noticed the dinosaur cross the street! She saw the shape clearly as it passed another cars headlights on the opposite side. She said oddly that the other car didn't seem to notice as the creature passed. She tried to call me but her phone was out of minutes.